Everything about the Rose Red City of Petra is enchanting. 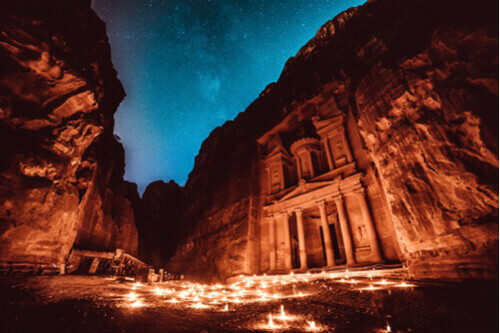 From the mysterious Nabataeans who built it, to the ease at which their empire fell and the sheer brilliance of each hand-carved construction, it’s no surprise that this UNESCO World Heritage Site is the most visited spot in Jordan. Petra is such a fixture on the ancient tourism landscape that it’s hard to imagine a world before modern society knew it existed. 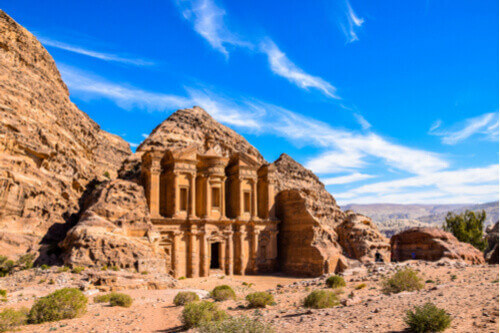 Yet the city was hidden amongst the vast Jordanian desert for many years, until it was rediscovered by Swiss explorer, Johann Ludwig Burckhardt, in 1812. The Nabataean people were a fascinating nomadic group that migrated to Jordan from Arabia. It’s not clear when the Nabataeans first arrived but remains of the city date back to the first and second centuries BC. Although they preferred to move around according to the seasons, the Nabataeans built Petra as a capital for the various trade routes that ran through Jordan, connecting Asia to Europe via the Persian Gulf and Port of Gaza. The route was mostly used for the trade of spices, but also included things like incense, herbs, medicines, jewels and fabrics. As the years went on, the trade routes flourished, bringing in significant profits for the Nabataeans. 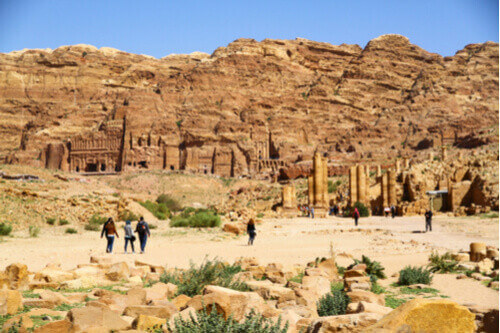 By 106 AD, the brief Nabataean empire had fallen and the Romans had seized power of Petra, but continued to utilise it as a trade hub until routes changed and its success waned. After significant earthquake damage, the city was eventually abandoned and lost to the desert for many centuries. The journey from the entrance gate to the actual city of Petra is one of great natural beauty. Imposing rose-coloured rock formations surround the path and dictate the way it twists and curves. Depending on the time of day, the rocks glow different colours - golden in the morning sunlight and pinky red in the afternoon shadow. Watch out for horse carriages barrelling down the path as you wind your way through the siq (main entrance to Petra), examining the many niches carved out of the rock, originally for sculptures of prominent deities. Reach the end of the 1.2km siq and you’ll be rewarded with your first glimpse of the breathtaking Al-Khazneh (Treasury Building). Although the Treasury is the most recognisable facade in Petra, the city stretches to an astounding 264sq km and features many intricate rock carvings. A walk down the central path will lead you to countless structures, including ancient houses, places of worship and royal tombs, while those capable of more arduous hikes can explore the valley in greater depth and visit the Al-Deir or Monastery. Among the visible constructions there are also features built into the landscape that are less obvious, yet equally important - these are things such as advanced irrigation and water storage systems, which ensured that the city could withstand harsh desert conditions. 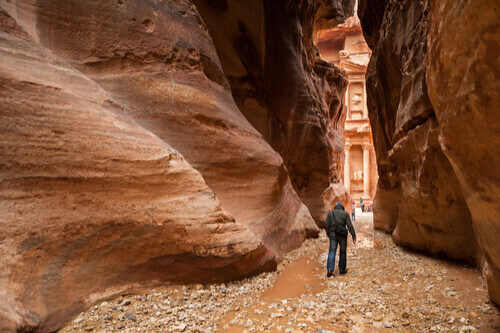 Amazingly, historians believe that almost 85% of Petra is still buried under centuries of sand. It’s impossible to speculate what else will have been uncovered a century from now, but the 15% that has been excavated is one of the most spectacular sights on earth.